All those interested in the process of construction of OSP fiber optics - managers, designers, supervisors as well as contractors and installers - This course is particularly good for those involved in managerial roles whose responsibility includes fiber optic communications systems and who need to know how these systems are built. FOA has extensive training programs and certifications on all aspects of fiber optic cable plant design, installation, testing and operation, but most outside plant (OSP) programs begin at the point of preparing the cable for splicing, termination or testing. This program takes a step back and looks at the process of construction of the cable plant up to the point of installing the cable. In the movie business, this would be the prequel. The construction of the OSP cable plant involves the installation of underground, direct buried or aerial cable. Each of these types of installation have their special knowledge, options regarding the actual construction and cable installation methods. And, of course safety issues. This course will deal with all types of cables and construction to ensure the person taking this online course becomes well-versed in all methods. The aim of this course is to educate all types of personnel on fiber optic OSP construction. It is written for the managers of network projects, for example a city manager or utility manager whose organization is contracting for the installation of a fiber optic network. It is also written for designers of projects who have completed a FOA CFOS/D design course but want to know more about the processes of cable plant construction. It is also appropriate for owners, managers and supervisors of contracting companies who want to know more about fiber optic cable plant construction. And, of course, it is also for those who have already attained their CFOT or CFOS/O certifications who want to know more about the construction aspects of projects they will be involved in. This program has been developed as a cooperative effort of many volunteers from the FOA. If you have comments or suggestions on how to improve it, please contact us at info@foa.org. This Fiber U self-study program will divide the construction of OSP fiber optics into a number of lessons. 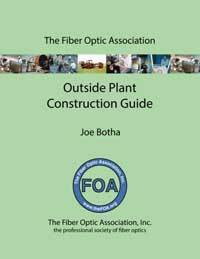 Each lesson will have a brief introduction to the subject, telling you what you should learn from that lesson, and will then link you to several pages on the FOA Online Reference Guide to OSP Fiber Optic Construction, the printed FOA OSP Fiber Optics Construction Guide or chapters/sections in the FOA Reference Guide to Outside Plant Fiber Optics printed textbook for you to study. Most of the lessons will have online quizzes for you to test your comprehension, as will each chapter in the textbook. For each section, you should take the quiz and check your answers, returning to the study materials to find out why you missed any questions. When you finish all lessons, you will be well-versed in the basics of fiber optics and ready for more! If you are just getting started, you should consider attending an FOA-Approved school where you will be trained in hands-on labs to develop the skills needed to be successful in fiber optics. Please note: receiving this Fiber U Certificate of Completion does not include FOA certification but it does become documentation of your knowledge of fiber optics and should be part of your portfolio of documented knowledge, other training and work experience that can qualify you to apply for FOA certifications through the FOA "Work to Cert" program. More details on getting a Fiber U Certificate of Completion are on the last lesson. Read more about the Fiber U Certificate of Completion program. 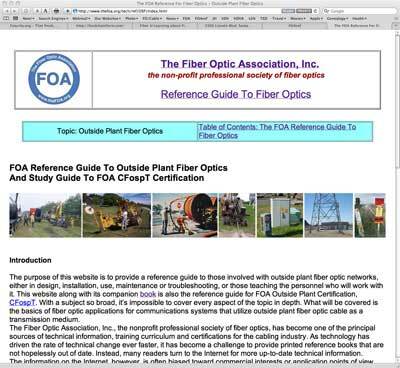 You can take this Fiber U Online course using either of these online or printed reference materials. Read the materials linked on each lesson plan and take the quiz. This information is provided by The Fiber Optic Association, Inc. as a benefit tothose interested in teaching, designing, manufacturing, selling, installing or using fiber optic communications systems or networks. It is intended to be used as aoverview and/or basic guidelines and in no way should be considered to be complete or comprehensive. These guidelines are strictly the opinion of the FOAand the reader is expected to use them as a basis for learning, as a reference and for creating their own documentation, project specifications, etc. Thoseworking with fiber optics in the classroom, laboratory or field should follow all safety rules carefully. The FOA assumes no liability for the use of any ofthis material.